Whether it’s scheduled maintenance, repair service or replacement projects, our goal is ultimate client satisfaction by providing exceptional service at reasonable pricing. Our portfolio highlights just a few of our projects. Chiller Services, Inc. at a Glance…….. Since 1974 Chiller Services, Inc. has provided the Carolinas with Quality Service on all types of Commercial and Industrial Air Conditioning Equipment. Our factory trained Technicians are qualified to perform service and repairs on all manufacturers equipment Including: Trane, Carrier, York and McQuay. This service is not limited to the chiller unit only, but also rooftop units, pumps, air handlers, cooling tower, controls, etc. In other words we provide Total System Service. 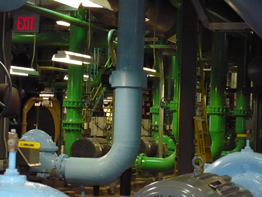 Chiller Services offers single-source excellence in providing solutions for HVAC and Mechanical Systems. With over 3 decades under the belt we have built some of the strongest service capabilities by emphasizing in-house expertise and facilities. Since day one our mission has focused on constantly providing the highest quality craftsmanship, project management and client service. Chiller’s capabilities are divided into three departments briefly described below. Providing comprehensive service for all HVAC applications, mechanical systems, and process cooling. Factory and Independent technician training for all major manufacturers’ equipment.